Wherever you go, run with all your heart. It’s not very often that I say that I “swear by” something. I don’t remember who said variety was the spice of life (or I’m just too lazy to Google it), but whoever said it got it right. However, for the past two years, I have been making a smoothie that I (deep breath) swear by: my banana spinach smoothie. Yep. Banana. Spinach. Together. In a refreshing, vitamin and mineral, protein-packed fountain-of-youth-esque medley of clearer skin, stronger hair, faster muscle recovery, consistent [ahem] regularity, better sleep, and sturdier bones. 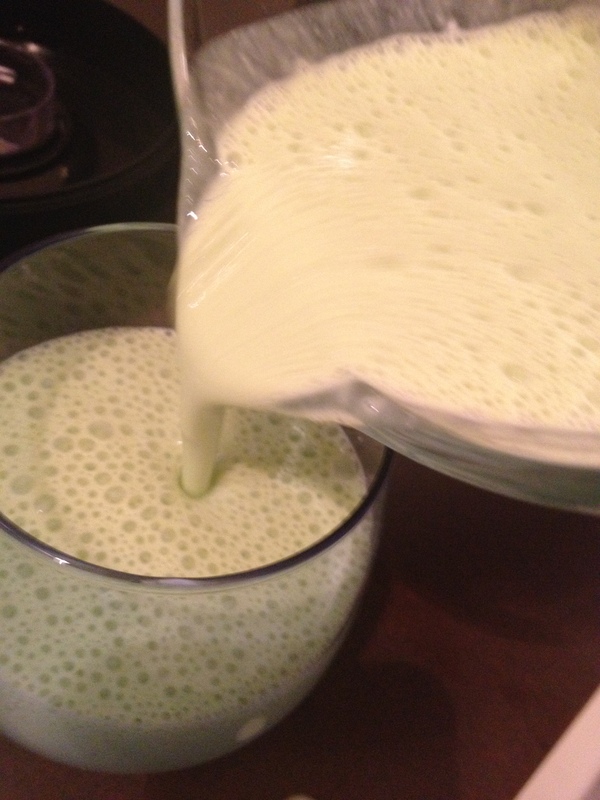 Nicknamed by a less-than-convinced ex-boyfriend the “baby poop smoothie” for its pale green color (something I still find funny), this versatile blend has earned the coveted spot of “never letting you go” in my vast array of daily clean and healthy eats. And you can’t taste the spinach. Seriously. Unless you add too much and then, well, that’s your fault! Have I talked you out of trying it? I have a tendency to oversell. And it’s too bad the word ‘spinach’ is so ugly. Try it and see for yourself. 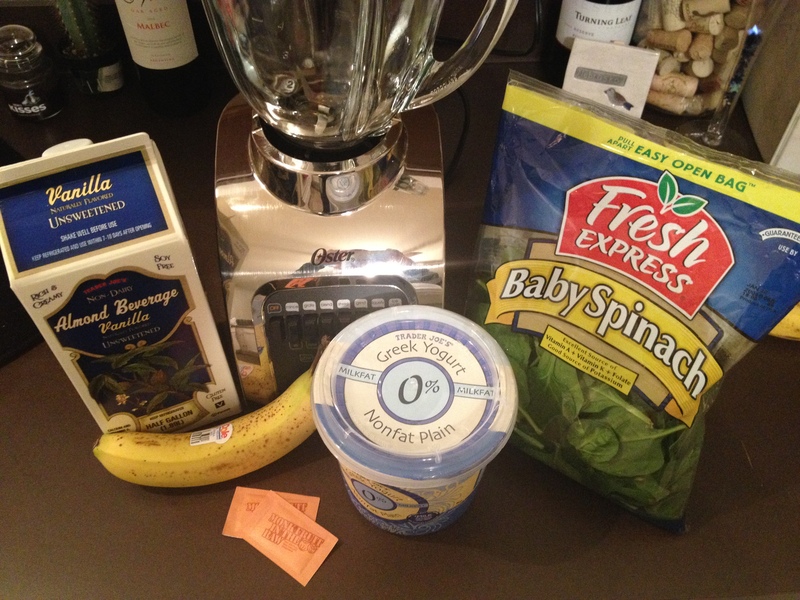 Blend all ingredients until smooth, meaning that all the spinach leaves are liquefied. Nothing worse than a chunk of spinach crashing your freshly-brushed teeth parade, am I right? If you get the ingredients at your local friendly Trader Joe’s, the smoothie will cost you approximately $2.47 per day if you go with the most basic recipe and use your ingredients in five days. And it keeps you full for hours. Speaking of basic recipe, did I mention that this smoothie recipe is highly versatile? From adding a cup of blueberries, strawberries, or pretty much any kind of fruit you can think of to using vanilla or fruit-flavored nonfat Greek yogurt (but watch the sugar! ), you can change the recipe to make this smoothie your own. I’ve added everything from peanut butter, an avocado, cocoa powder, even protein powder when making this smoothie after a long run. I’ve also switched up the spinach to add kale, but I couldn’t figure out how to blend out the kale specs and it sort of grossed me out. Here are the nutrition facts from My Fitness Pal: 224 calories, 3.9g fat, 266.8mg sodium, 917g potassium, 33.6g carbohydrates, 4.6g fiber, 19g sugars, 15.8g protein, 67% Vitamin A, 22% Vitamin C, 62.3g calcium, 9% iron. Yes please!! Also, the ingredients are ridiculously good for you. Any Google search will yield the immense benefits of the ingredients. Bananas have heart-healthy, blood pressure lowering, stroke-preventing potassium, mood-elevating B vitamins, calcium-absorbing prebiotics, plus fiber, selenium, and manganese. Spinach is packed with anti-inflammatory, cancer-preventing antioxidants and bone-healthy vitamin K, plus iron for those of us who get tired easily (me) and unnerving folate. Nonfat Greek yogurt delivers a solid pack of protein, calcium, and probiotic bacteria while almond milk carries a serious dose of calcium while keeping me off of dairy milk (that commentary is for another day). So, give this smoothie a whirl and a whip and let me know what you think!